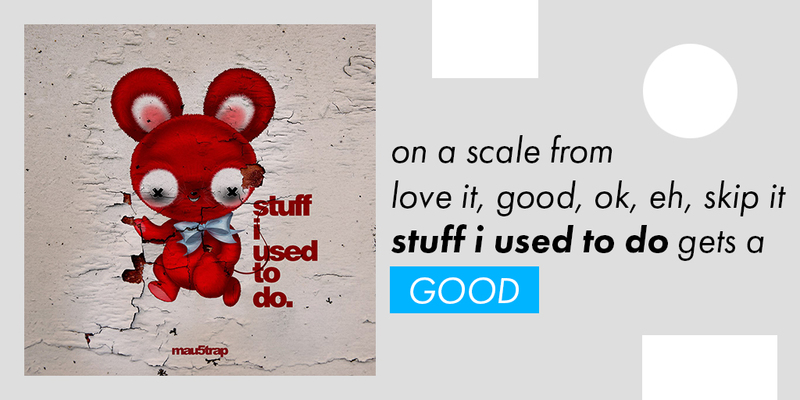 As the title suggests, stuff i used to do is a compilation of older work to slightly more recent work that deadmau5, real name Joel Zimmerman, had been allegedly hiding for practically the last 20 years. It’s not odd to see an artist traipsing through unreleased territory. But it is peculiar when there already exists two compilations of suppressed tracks (technically three, but Project 56 was a mix of originals and reissues from debut Get Scraped intended to cultivate 56 really short tracks for “short attention spans”). Deadmau5 Circa 1998-2002, or Halcyon441, was released solely on SectionZ, the SoundCloud of the mid-2000s, in 2006. That same year, er, that same day, A Little Oblique was released, also on SectionZ. But since SectionZ has been defunct for some time now, stuff i used to do is clearly the most accessible out of the bunch. So it’s no question why Joel stuffed stuff with a handful of previously released ‘unreleased’ tracks. In fact, only 3 out of the 16 tracks (according to some research on my end) were completely withheld. “Messages from nowhere” was originally issued on the CD version of Get Scraped (for which there only were 500 copies made). So no one could’ve possibly been able to hear this one before (unless you’re the owner of at least 1 of those 500 copies). Either way, it’s a rock-induced electronic coma mixed with incomprehensible vocal samples, and it’s just delightful. Appearing initially on Halcyon441, “Screen door” is a staccato play on cutesy synth that would fit too well in a soundtrack for The Sims. It’s perhaps the furthest Joel has gone away from his idiosyncratic dark synth and brooding bass. The robotic vocals sound as if random sentences were typed into some amateur text-to-speech application, which provides additional humor to the track’s already lighthearted output. A true blast from the past, “Squid” makes a sweet transition as a short, action-packed sequence of drum n’ bass. It capitalizes on the kind of structure Joel mostly used in his earlier work, including Get Scraped and Project 56. Even though it was originally released on A Little Oblique, it triumphs on nostalgia. The sampling reaches its peak and humor in “Sometimes I Fail;” and it’s the last time samples are incorporated for the remainder of the compilation. Joel takes you through a prehistoric lesson on what is considered “uncool,” while a disturbingly pleasurable array of synth and bass fill the dialogue’s outer rim. “HaxPigMeow” is when Joel really starts to sound familiar. You can tell by its length and repetitive synth swings that it was created more recently in comparison to other material. The 10-plus minute track, which wasn’t previously released, reverts back to his old ways, and effects the way the rest of the album is perceived. Even though the bulk of the last 7 or so tracks are from pre-existing compilations or albums, there’s a similar construction in the way this track was created in most of them. However, it’s not a drawback. Especially when it comes to the remix of Rubik’s “Obsidian.” That bit of earworm is worth getting stuck up top. Some previously released tracks are even better this time around. The remastered version of “Creep” strips away small electronic elements and leaves the piano solo as is. By distorting the notes like he did on “Screen door,” intensity is added, rendering the original quite the bore. The only downside is the title; it should’ve been called stuff i do now. It is seriously the most entertaining deadmau5 album we’ve received in some time–even though it’s a compilation. Joel finally strikes a balance between fun and long-winded. He was close with W:/2016ALBUM/, for which I wrote a review detailing why (yes, I used to write for EDMTunes). But since most of the tracks weren’t that good to warrant anything special (and Joel himself thought so too), his eighth album will fall by the wayside. With stuff, the different attitudes and approaches-to-sound mixed together is exactly what would not only lift his spirits, but gain him even more followers. One can only hope he’ll be inspired by the work he showcased to move in a more experimental, and complex, direction. GOOD.